Follow our trends news and stay up to date. Technology Transfer is defined as “the process of transferring technology from its origination to a wider distribution among more people and places.” Various communities such as business, academia and government are routinely involved in these initiatives including across international borders, both formally and informally. The primary desire is to share expertise, knowledge, technologies, methodologies, facilities, and capabilities among governments or universitiesand other institutions to ensure that scientific and technological developments are accessible to users who can then pursue development, robustification, design for manufacturability and exploit the technology into new products, processes, applications, materials or services. There are several types of returns. First, for the stakeholder’s investment in the research itself. Second, for creation of new job opportunities. Lastly, for a new product or service that is likely to impact the health and viability on a global scale. The U.S. government invests some $135B each year to advance science and technology (S&T) as the basis for breakthrough knowledge development and new innovations, of which around 20 to 30 percent is invested in successful Technology Transfer. The federal S&T budget is a sizeable sum. In fact, the federal laboratory ecosystem provides a home to several hundred thousand scientists and engineers working to solve some of the most significant scientific challenges on a national and global scale. The national laboratories alone annually produce 11,000 peer reviewed publications and over 1,700 reported inventions and 6,000 active technology license agreements. However, the primary mission of the federal laboratory ecosystem is to perform basic research for scientific discovery to, support national defense and other missions, and to perform research and development in spaces where industry is not yet ready to lead. Unlike both public and private commercial companies, the federal laboratories perform R&D with neither specific products nor services directly in mind. Most work in the public interest, and are often trusted advisors of the government. They understand the mission space, the requirements, and the gaps that need to be closed to improve safety and security of the nation. The primary customers of the output from federal laboratory research and development efforts are often the federal agencies directly funding the work, since commercial transfer brings private funds to bear to bring products to market with government funded intellectual property inside. It is also an expectation as part of the charter of federal laboratories in 1986 that successful commercial outcomes are resultant benefits of the high-performance research programs. What are the perceived barriers of Technology Transfer? Is it leading-edge and breakthrough? All these factors contribute to the ultimate value positioning opportunity for transfer. In addition, federal laboratories are not evaluated directly by their sponsors on the commercial impacts of their research initiatives, and are in many cases discouraged from “picking winners and losers” in their effort to remain the unbiased and trusted advisors of the government. Due to the nature of their funding, federal laboratory research outputs are atypically complete product solutions and are most often in the early stage of development. Companies to which the outcomes are transitioned must provide additional resources to develop research results into commercial, robust, sustainable products and services, and in the case of any environmental or medical technologies, seek appropriate regulatory approvals and often conduct clinical trials, if necessary. These additional steps consume further investment dollars, can dilute internal company efforts, and seriously hinder the attractiveness of the transfer opportunity. Furthermore, most successful products combine multiple innovations from a variety of sources to meet customer needs. A single technology license rarely provides a complete solution. These circumstances are especially true for the output from federal programs. The ability to deliver a final product is rare, and outputs are routinely seen as components ready for embedding into other more complex offerings. Other issues that present barriers, in the case of federal R&D, is that the initiatives emanating from the federal laboratories are perceived to be difficult for companies to access. This is due largely because researchers must obtain funding for all their labor hours, and relatively few resources are available to support sustained collaborations with companies unless they are negotiated within the license agreement itself. Frequently, early stage companies pursuing technology transfer opportunities require assistance and mentorship not available at federal laboratories. The hope is that some of the newly created and established accelerators and incubators with associated mentoring and guidance make for a more seamless transition route. Often good ideas resulting from the discovery phase at the federal labs are touted as moments away from widespread distribution, yet it rarely turns out to be the case. There is still a good deal of additional development, robustification, design for manufacturability, and even market positioning necessary before an “idea” evolves into a fully-fledged commercial opportunity. To streamline this process, encouraging entrepreneurs, investors and IP licensors to communicate a more perfect set of requirements necessary for “go-to-market” opportunities would eliminate the mismatch of expectations between the research and the commercial communities. Many existing reports, white papers and articles outline the barriers to successful Technology Transfer, and they inevitably focus on the existence of the “valley of death” defined as the phase directly after discovery yet before commercialization. Many articles describe the “push” perspective as the process by which technology moves from research to commercialization. However, the Technology Scouts, now a common formal position in many established companies, spend most of their time searching for technology in a market “pull” process to enhance and supplement a competitive, long-term company business strategy. Alignment of Mission: The technology must enhance, simplify, and supplement the mission and the strategy being pursued by the “scout.” It must be the answer to a problem that the scout is charged with solving by his or her stakeholders. When technology “pushers” try to convince scouts that they should be solving a different problem, the pushers, and the deal, will fail! Resources and Time to Market: The cost to innovate is immediate and certain, yet the value of the innovation is future and uncertain. There is an entire industry dedicated to predicting the value of future innovation, yet it is not an exact science and the elusiveness of the return and when it will be seen can be a killer! Company Exclusivity: Technology companies (and their owners) scale quickly when they have a superior value proposition and a sustainable competitive advantage. IP is a critical element in building a sustainable competitive advantage. For technology providers, this exclusivity model is not always good business since investment in IP has a return if and only when an exclusive partner successfully commercializes and scales; if it does not occur, the upfront costs for innovation are not recovered. What needs to change to improve Technology Transfer outcomes? Important in the process of Technology Transfer is the need for companies and the federal laboratory scientists to have a shared understanding of the resources provided by federal laboratories. The federal laboratories are tremendous sources of innovation and technical expertise, yet they cannot provide everything a company will need to develop and commercialize a product or technology offering. Programs exist to help companies access the capabilities of the federal laboratories. Notably, Cooperative Research and Development Agreements (CRADAs) provide mechanisms for companies to collaborate with national laboratories, and Strategic Partnership Projects (SPP)enable companies to sponsor research and development at national laboratories directly. Both programs require companies to invest private resources, either as in-kind contributions to collaborations or as direct project funding. One overarching opportunity, then, is for increased federal investment in collaborations with private sector partners to make the laboratories more accessible to companies with limited financial resources. The Argonne National Laboratory, for example, has supported a realization of this situation by implementing their Executive in Residence Program, where a company employed scientists working in close proximity at the federal lab during the later stages of technical development. The opportunity is then readily positioned for “spinning off” into its own entity—or to support future strategic initiatives in a well-established company. Additionally, there are other programs that offer extension or expansion pilot programs to support Technology Transfer, such as the Small Business Voucher Program (SBV), the Technology Commercialization Fund (TCF) and the various Small Business Innovation Research (SBIR) and Small Business Technology Transfer (STTR) programs. These programs target collaborations with federal laboratories that enable increased access to the laboratories and facilitate joint projects that can result in new products and subsequently the creation of new jobs. Expansion of other programs, such as the DOE Energy Investor Center and the DHS Transition to Practice (TTP) program, increase the visibility of the innovations and capabilities of the federal laboratories. At the same time, they help raise awareness of the commercialization opportunities that exist in the federal laboratories. If a project is pitched as perfection but delivers great, the project fails. If the project is pitched as good but delivers great, the project succeeds. Start-ups need to reign in how much perfection-pitching they perform. Investors, partners and acquirers need to view start-ups more realistically than their perception of a start-up’s ability to make overnight transformations. Aligning definitions of success and support at the stages of technology progression is critical to achieving positive outcomes. Mission alignment needs to continually improve. An increasing amount of research is being performed by universities and government so, as a result, there needs to be a protocol developed upfront to allow for alignment with established companies and any start-ups that ultimately commercialize the technology and discover marketing positioning for an output product. Terms and agreements are also critical components for Technology Transfer because with investment in research, costs occur immediately yet revenue is future and uncertain. Any licensing terms need to share this inevitable risk, and provide the freedom for the licensor to pursue other licensees in cases where a commercialization effort does not meet certain financial goals. What kind of regulatory/mandatory changes need to take place? Federal laboratory scientists are often willing to help companies adopt their technologies, as evidenced by the success of the Argonne Laboratory’s Executive in Residence Program, as well as MITRE’s first-hand experience of partnering with them to develop and nurture opportunities. It takes a team to deliver Technology Transfer successfully. However, federal labs have limited funding available to support engagements with private sector companies unless incorporated directly into the license itself. Mandating availability of increased funding of this kind, as well as reducing the administrative burden associated with accessing those funds, would drive greater private sector engagement with the federal laboratories, and thereby increase the commercial impacts of federal laboratory research and development. In terms of mandatory changes to facilitate the delivery of and derive benefits from new innovative products in healthcare, for example, supported by a connected Digital IT architecture, investment in a standard interoperability framework would be highly significant. Currently, the landscape is diverse, and pointedly so in healthcare, where hospitals each operate individually with different system installations that limit the ability to interface seamlessly across institutions. Under these circumstances, it is impossible for any new innovations to be easily accessible by all points of the domain due to lack of an interoperability mindset. In addition, encouraging a more patient-centered architecture would lead to an increasingly robust innovation environment for healthcare. In fact, it has been shown that having patients involved in their healthcare improves results and lowers costs. What can government agencies do to enhance opportunities? Federal laboratories are ultimately driven by the goals and objectives of their funding agencies and offices, and they remain the bedrock for delivering outcomes for national defense as well as national safety and security. Technology Transfer Offices can help companies access the innovations and capabilities of the federal laboratories by increasing the programmatic value they place on such engagements, and actively encourage or support the interactions. In effect, this approach will benefit their needs, too, by making a product or service readily available, in a robust way, at economically viable price points. There are also more likely to be further and future advancements of the technology available in due course driven by the product development efforts of the commercial company. This outcome would undoubtedly reduce sustainability costs for the agency as their needs would continue to be serviced directly from private funds. As noted earlier, extending and expanding programs such as SBV and TCF would likely increase private sector engagement with the federal laboratories. Government agencies also can help with mission alignment. A good example of this approach was the space race in the 1960s. There are also several other examples where the government has been the catalyst for successful technologies that generate commercial breakthrough opportunities. Agencies should be setting goals and metrics and providing financial incentives for academia, federal labs, and the private sector to work together to meet these goals. Nevertheless, the government needs to avoid picking winners and losers because only the market can determine the future value of any technology. Once the “macro” level goals are set for alignment, individuals (scientists, innovators and engineers) need to be trained on the behavioral science of how better to understand the “micro”’ level needs of the others in the chain. The NSF (National Science Foundation) I-Corps and the Fed-Tech program deliver value by helping innovators and entrepreneurs understand product market fit through experiential training in discovering needs. Similar programs, designed to align fundamental research to commercialization, would go a long way towards improving the situation. The Innovation Research Interchange (formerly known as the Industrial Research Institute) is helping to support match-making initiatives through its Federal Laboratory Activity Group (FLAG). Specific areas of focus are: Energy/Sustainability, Advanced Materials/Manufacturing, Cyber Security/Data Analytics and Robotics/Automation. The government makes a good partner because it is a natural convener of new discoveries, can sustain much longer term strategies compared with industry, and is not under the demands of shareholders. Rather, it is often neutral and can enable even typically competitive organizations to collaborate for the greater good of society. While governments are not expected to over-regulate, their ambiguous guidelines can sometimes lead to fragmentation if the industry does not reach consensus, as evidenced by the lack of interoperability in the healthcare segment. If the government actively engages industry, then further fragmentation would be avoided and the associated longer term problems likely minimized. What can and how can we help entrepreneurs to aid the process to success? Supporting entrepreneurs to quickly achieve a “Yes/Go” or “No/Go” pitch to future investment is critical. For example, a start-up entity often has 12 to 18 months of runway, during which time it needs to quickly succeed or fail (and pivot, if appropriate). With limited resources, the team is unable to spread itself thinly and therefore must remain focused on its target goal. A “maybe” response is a killer; it results in burning resources and does not help entrepreneurs to understand clearly if their product is providing true value. Being harsh but factually quantitative enables a better outcome for all. Entrepreneurs themselves fall into distinct groups as determined by their efforts. Entrepreneurs focus on target-market fit and sustainable advantages of their products to attract investors. They need exclusivity yet have limited funds for licensing. For many start-ups, future equity is their only currency, so they need financial resources to help solve the problem. What can well-established companies do to improve interaction, integration and chances of success? Investing time with the federal laboratories to learn more about ongoing research activities and outputs is one way to improve outcomes. Most research results are complex and are “works in progress.” While it is relatively rare to find a nearly commercially-ready technology solution in the laboratories, the laboratories have deep expertise and capabilities and can help companies quickly solve complex challenges. Additionally, there is the need to resist the urge to negotiate the terms and conditions of collaboration agreements with federal laboratories. Most laboratories can quickly implement standard agreements, yet must seek multiple levels of federal approval for non-standard agreements, significantly increasing the time required to put an agreement in place. Furthermore, federal laws and policies limit the extent to which partnering agreements can be substantively changed, so that lengthy negotiations rarely result in significant changes in agreement terms. Defining success at the stages of discovery, development, deployment and distribution are key to having projects reach positive outcomes. Without this expectation setting, project timing will be misaligned and it will be challenging to realign the stage-appropriate support to achieve real business value. Again, the three conditions associated with barriers to success apply—namely, alignment of mission, resource needs and time to market, together with company exclusivity. However, where a start-up may be heavily dependent on IP as a sustainable competitive advantage, large companies have other factors contributing to that competitive advantage, for example, brand, supply chain, scale, and channels. Large corporations will tend to “engineer” around patents in their commercialization process. Acquisition of IP will occur through licensing if it is core and foundational, and they cannot overcome the barrier. They will also only buy/license IP in times of disruption or transition. Generally, this outcome is achieved by acquiring a start-up that has commercialized a proven product market fit. In effect, established corporations are looking for products, not research, when they need technology. How can the VC communities and start-ups take advantage of outcomes from federally funded programs? Interactions between venture capital (VC) communities and start-ups present several areas for improvement. For example, enabling them to interface and work routinely with universities and other programs would increase their familiarity and comfort level with federally funded initiatives. However, it is also important to note that writing a successful grant application is very different than preparing a strong business pitch deck. Encouraging portfolio companies to visit and engage with the federal laboratories to learn about available technologies and collaboration opportunities would certainly drive enhanced relationships leading to technology transfer. Allied Minds is one such company that routinely interfaces with several federal entities with the primary objective of accessing and gaining exposure to early stage IP. In the main, Technology Transfer offices are always happy to coordinate visits from prospective collaborators. VCs are essentially risk managers and are unlikely to accept more risk to increase the flow of IP. VCs need to see their investments explode—or fail fast. Return on investment from Technology Transfer extracted from federal labs would undoubtedly increase if the lab can define the path to commercialization, even if they cannot execute that path due to their mission. Quantified data linking research to customer will attract VCs. As such, NSF I-Corps, Fed-Corp and DHS TTP initiatives are helpful programs. If technology has an assessed product market fit through a customer discovery process using scientific methods, in addition to the science of the invention, there is less risk. VCs will take advantage of this type of program in their investment decisions. There is currently a mass of untapped technical potential and IP sitting on shelves within the federal laboratory ecosystem that has been funded by federal agencies. We know that those concepts which do make it to market, such as laser technology from the 1960s, have compelling impacts, solve national and global problems, provide a catalyst for greater success by industry alone, and drive the economy and GDP of the country. The laser is only one such technology, the Internet is another—it started life at the Stanford Research Institute (SRI). And there are also many technologies we rely on today that emanated from the space race. For years, the secondaries market had been considered a small, sometimes-overlooked niche within private equity. After a year in which secondary investors amassed a record $74 billion of transaction volume, the momentum and growing impact of this “niche” can now be felt across the more expansive global PE landscape. When the secondaries market first took root, the appeal was that it allowed investors to either sell limited partnership interests in existing funds or unload direct investments in companies within a captive portfolio. The upshot, of course, was that secondaries were able to offer liquidity in an otherwise illiquid asset class. But as the secondaries market has grown in size, both limited partners and general partners are increasingly using the market to optimize their portfolio management. LPs, for instance, will use secondaries to continually refine their PE allocations, whether to minimize the J curve, improve diversification, or redeploy capital into newer funds with potential for more upside. GPs, alternatively, are turning to secondaries to effect restructurings in which existing LPs can exit a fund, knowing that new commitments bring additional capital and more time to fully realize remaining investments. In a sense, secondaries have helped to further mainstream private equity and have brought a level of flexibility that appeals to both newer investors and most sophisticated LPs, alike. An unintended consequence, however, is that the growth of the secondaries market has also brought more scrutiny to valuations. This is particularly the case as GP-led transactions become more common. As the proportion of GP-led secondaries have grown – by nearly a third year-over-year according to Greenhill & Co. – and the fact that they are becoming more common earlier in a funds life, the potential for conflicts of interest have investors and regulators scrutinizing valuations that much more closely. This should further dissuade GPs from attempting to smooth over any near-term volatility in their approach to valuation. A recent Secondaries Investor article, for instance, highlighted some of the concerns raised by Oregon’s State Treasury in its annual private equity review. The pension noted that innovation in the secondaries market is translating into more complexity. Recaps involving more nascent partnerships can disrupt the alignment between GPs and LPs. “While all of this has a place in a maturing private equity industry,” the pension noted, “the aggressive pace of innovation may suggest that secondary buyers have more appetite for deals than the current market can satisfy.” A corollary — one that brings to mind Ockham’s Razor – is that the innovation to accommodate this demand can also breed “complex and conflict-riddled transaction proposals,” the pension added. That’s not to say that GP-led secondaries, on their own, are worthy of special attention or are in any way misleading. Still, many investors will use these transactions as an opportunity to revisit the mark-to-market valuations that usually serve as the basis for pricing secondary transactions. Regulators, too, are paying close attention. Four years ago, just as GP-led secondary transactions were becoming more common, the SEC’s then director of the Office of Compliance Inspections and Examinations Marc Wyatt identified in a speech that the agency was indeed watching and addressing “issues such as zombie advisers and fund restructurings.” Since then, at least two GPs, in 2016 and last fall, have faced enforcement actions related to either valuations used in secondary transactions or potential conflicts that should have been disclosed. By and large, though, the rise of the secondaries should be celebrated as an advance for the asset class. As the growth and increasing utility of the secondaries market continues in PE, so too does the transparency that aligns GP and LP interests. Ultimately, beyond providing confidence to investors and helping all constituencies manage risk, third-party independent valuations can also support ongoing growth of the secondaries market by imparting trust in the valuation that is helpful in navigating the added complexity. Robert A. Tribuiani leads the overall business development efforts for Murray Devine Valuation Advisors. In this role, he is responsible for new business and works closely with the valuation client services team to support existing clients. Before joining Murray Devine, Rob worked as a senior business development executive for SolomonEdwards, a leading professional services firm headquartered in suburban Philadelphia and in similar roles for Longview Solutions and VerticalNet, both private equity backed companies. Rob is a graduate of Villanova University and earned a Bachelor of Science degree in Business Administration with a concentration in Finance. I’ve watched lots of companies attempt to deploy machine learning — some succeed wildly and some fail spectacularly. One constant is that machine learning teams have a hard time setting goals and setting expectations. Why is this? 1. It’s really hard to tell in advance what’s hard and what’s easy. Is it harder to beat Kasparov at chess or pick up and physically move the chess pieces? Computers beat the world champion chess player over twenty years ago, but reliably grasping and lifting objects is still an unsolved research problem. Humans are not good at evaluating what will be hard for AI and what will be easy. Even within a domain, performance can vary wildly. What’s good accuracy for predicting sentiment? On movie reviews, there is a lot of text and writers tend to be fairly clear about what they think and these days 90–95% accuracy is expected. On Twitter, two humans might only agree on the sentiment of a tweet 80% of the time. It might be possible to get 95% accuracy on the sentiment of tweets about certain airlines by just always predicting that the sentiment is going to be negative. Metrics can also increase a lot in the early days of a project and then suddenly hit a wall. I once ran a Kaggle competition where thousands of people competed around the world to model my data. In the first week, the accuracy went from 35% to 65% percent but then over the next several months it never got above 68%. 68% accuracy was clearly the limit on the data with the best most up-to-date machine learning techniques. 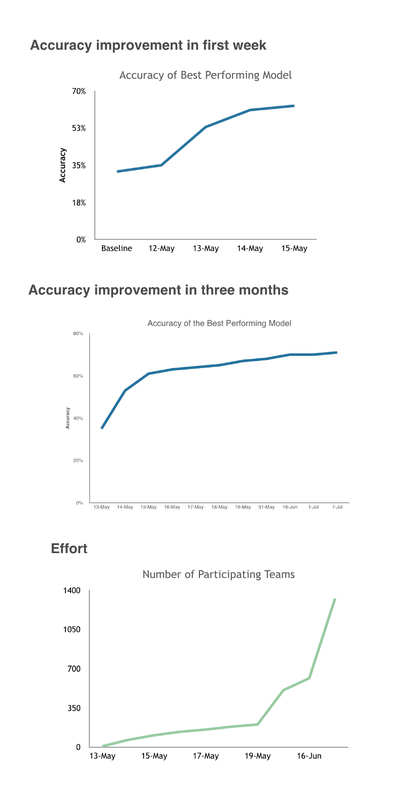 Those people competing in the Kaggle competition worked incredibly hard to get that 68% accuracy and I’m sure felt like it was a huge achievement. But for most use cases, 65% vs 68% is totally indistinguishable. If that had been an internal project, I would have definitely been disappointed by the outcome. My friend Pete Skomoroch was recently telling me how frustrating it was to do engineering standups as a data scientist working on machine learning. Engineering projects generally move forward, but machine learning projects can completely stall. It’s possible, even common, for a week spent on modeling data to result in no improvement whatsoever. 2. Machine Learning is prone to fail in unexpected ways. Machine learning generally works well as long as you have lots of training data *and* the data you’re running on in production looks a lot like your training data. Humans are so good at generalizing from training data that we have terrible intuitions about this. I built a little robot with a camera and a vision model trained on the millions of images of ImageNet which were taken off the web. I preprocessed the images on my robot camera to look like the images from the web but the accuracy was much worse than I expected. Why? Images off the web tend to frame the object in question. My robot wouldn’t necessarily look right at an object in the same way a human photographer would. Humans likely not even notice the difference but modern deep learning networks suffered a lot. There are ways to deal with this phenomenon, but I only noticed it because the degradation in performance was so jarring that I spent a lot of time debugging it. Much more pernicious are the subtle differences that lead to degraded performance that are hard to spot. Language models trained on the New York Times don’t generalize well to social media texts. We might expect that. But apparently, models trained on text from 2017 experience degraded performance on text written in 2018. Upstream distributions shift over time in lots of ways. 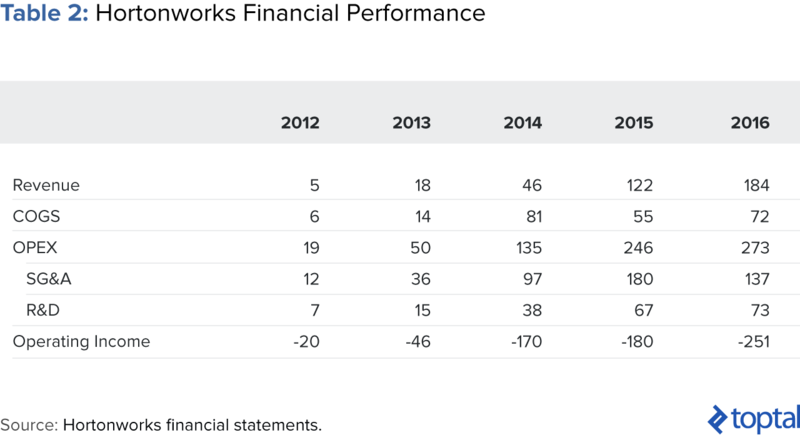 Fraud models break down completely as adversaries adapt to what the model is doing. 3. Machine Learning requires lots and lots of relevant training data. Everyone knows this and yet it’s such a huge barrier. Computer vision can do amazing things, provided you are able to collect and label a massive amount of training data. For some use cases, the data is a free byproduct of some business process. This is where machine learning tends to work really well. For many other use cases, training data is incredibly expensive and challenging to collect. A lot of medical use cases seem perfect for machine learning — crucial decisions with lots of weak signals and clear outcomes — but the data is locked up due to important privacy issues or not collected consistently in the first place. Many companies don’t know where to start in investing in collecting training data. It’s a significant effort and it’s hard to predict a priori how well the model will work. What are the best practices to deal with these issues? 1. Pay a lot of attention to your training data. Look at the cases where the algorithm is misclassifying data that it was trained on. These are almost always mislabels or strange edge cases. Either way you really want to know about them. Make everyone working on building models look at the training data and label some of the training data themselves. For many use cases, it’s very unlikely that a model will do better than the rate at which two independent humans agree. 2. Get something working end-to-end right away, then improve one thing at a time. Start with the simplest thing that might work and get it deployed. You will learn a ton from doing this. Additional complexity at any stage in the process always improves models in research papers but it seldom improves models in the real world. Justify every additional piece of complexity. Getting something into the hands of the end user helps you get an early read on how well the model is likely to work and it can bring up crucial issues like a disagreement between what the model is optimizing and what the end user wants. It also may make you reassess the kind of training data you are collecting. It’s much better to discover those issues quickly. 3. Look for graceful ways to handle the inevitable cases where the algorithm fails. Nearly all machine learning models fail a fair amount of the time and how this is handled is absolutely crucial. Models often have a reliable confidence score that you can use. With batch processes, you can build human-in-the-loop systems that send low confidence predictions to an operator to make the system work reliably end to end and collect high-quality training data. With other use cases, you might be able to present low confident predictions in a way that potential errors are flagged or are less annoying to the end user. The original goal of machine learning was mostly around smart decision making, but more and more we are trying to put machine learning into products we use. As we start to rely more and more on machine learning algorithms, machine learning becomes an engineering discipline as much as a research topic. I’m incredibly excited about the opportunity to build completely new kinds of products but worried about the lack of tools and best practices. So much so that I started a company to help with this called Weights and Biases. If you’re interested in learning more, check out what we’re up to. Although the news was inconspicuous at the time in Japan, it was indeed remarkable that Airbus Ventures participated as a lead investor in the $7.3 million Series A round for Infostellar, a Tokyo-based satellite antenna sharing platform in September 2017. The financing was substantially the first lead investment by a venture capital arm of a prestigious European multinational corporation in the Japanese startup history. In addition to Infostellar, Airbus Ventures participated in the $11 million Series A round for Trillium Secure, a presently Sunnyvale-headquartered cyber security technology startup originally established in Tokyo. The financing led by JAFCO Japan, one of the largest VC firms in the country, in July 2018 is another funding round which involved a venture capital arm of an eminent European MNC, Deutsche Bahn Digital Ventures this time. The recent two investments above imply a newly emerging omen that European capital has gradually started to go towards Japan. However, contrary to the large market sizes of and trading volumes between Europe and Japan, both a number and amount of bilateral investments are still small for the time being. Major reasons behind this limited interaction are considered to be the low visibility of Japanese startups and a lack of necessary information for investment examination in Europe. Therefore, this article principally aims at introducing the latest ecosystem and rising deep tech startups in Japan to MNCs and VC firms in Europe. The global top 8 VC investment markets in 2017 from top to bottom are the United States ($71.9 billion), China ($40.0 billion), the United Kingdom ($5.8 billion), Israel ($3.9 billion), Germany ($2.9 billion), Japan ($2.5 billion), France ($2.4 billion) and Sweden ($1.7 billion). So, in terms of a VC investment amount, Japan is ranked 6th in the world, behind Germany and ahead of France. The VC investment amounts in Japan rapidly increased after the inception of the new economic growth policy “Abenomics” installed by the Abe Administration in 2013. The quantitative easing policy increased the amount of capital in the market and encouraged private-sector investment, resulting in the dramatic change in VC investment from $0.8 billion in 2013 to $2.5 billion in 2017 with a CAGR of 35.1%. Unlike other countries, there is a notable characteristic in Japan that corporations, instead of VC firms or institutional investors, have been the principal player in the market. Indeed, shares of VC investment amounts by players in 2017 from top to bottom are corporations (41.0%), financial institutions (16.1%), independent VC firms (14.8%), governmental agencies and universities (12.5%) and others (15.7%). A major reason behind this characteristic is the large amount of retained earnings as cash and deposits within Japanese corporations. The overall amounts of cash and deposits within Japanese corporations have continuously increased from $1.4 trillion in 2008 to $2.2 trillion in 2017. And the richest Japanese corporations such as Toyota, Sony and Mitsubishi have as much cash and deposits as the US “Tech Giants” such as Apple, Microsoft and Alphabet do. Large corporations also play an important role as Limited Partnership investors or sponsors of major VC funds. For example, the LP investors of World Innovation Lab, or WiL for short, the largest and most prestigious VC firm in Japan, are 28 leading corporations in major industries ranging from automobile and TMT to transportation and financial services. In addition to WiL, the lead LP investors of Global Brain, another VC giant, include large corporations such as KDDI, a major mobile operator, and Mitsui Fudosan, the largest real estate developer. Large corporations strategically invest in VC funds in order to search for promising startups as potential business partners, especially those in frontier domains. In the past couple of years, investment in deep tech startups has significantly increased. VC investments in deep tech fields such as but not limited to autonomous driving, robotics and UAVs dramatically increased in 2017. Comparing numbers of VC investments in the top 50 largest financing rounds, they are 3, 18 and 9 in 2016, 2017 and 2018, respectively. ispace, a space resource exploration company, raised $90 million, the largest financing in the Japanese startup history, from large corporations such as Japan Airlines, KDDI, Suzuki Motor, Dentsu and Konica Minolta as well as VC funds such as Mirai Creation Fund, the CVC of Toyota. In addition to ispace, GROOVE X, a consumer robot developer, raised a significant amount of approximately $40 million, mostly owing to the fame of its founder Mr. Hayashi, the product manager of Pepper at Softbank. Autonomous driving is a core field of deep tech which recently attracts a large amount of investment. Indeed, Preferred Networks, an AI for-IoT startup spun-out from the University of Tokyo, has raised $130 million in total until now, and its lead investor is Toyota which subsequently funded $8.2 million and $95 million in 2015 and 2017, respectively. The company is notable for its brilliant founders; they are among the most intelligent researchers in the field of AI and participated in the prominent International Collegiate Programming Contest by the Association for Computing Machinery. Preferred Networks has developed big data analysis infrastructures and deep learning frameworks, and now focuses on development of deep learning technologies for IoT. In this context, Toyota Research Institute, Toyota’s AI laboratory, partnered with Preferred Networks in 2017 to co-develop AI for autonomous vehicles. Another notable deep tech startup is Tier IV, a Nagoya University-origin startup established in 2013 which develops and provides corporations with Autoware, open source software for autonomous driving, and other hardware necessary for demonstration experiments. Tier IV has partnered with NVIDIA and intends to become a global de-facto standard in the field of autonomous driving software, through the distribution of Autoware for free. The company has raised over $25 million in total from large corporations such as KDDI, Sony, Yamaha and Aisan Technology, a surveying technology company. KDDI, Aisan Technology and Tier IV started a demonstration project of autonomous driving in February 2019. In the field of Urban Air Mobility, a hoverbike developer A.L.I. Technologies is remarkable. The startup was established in 2016 by students from the famed Department of Aeronautics and Astronautics at the University of Tokyo. It has been funded by Drone Fund, a fund dedidicated to investments in UAVs, and itself in turn invests in drone startups to construct a technology portfolio of drone-related IPs. The startup now develops a hoverbike called Speeder and relevant traffic control systems for UAVs. In addition to large corporations, it is funded by KSK Angel Fund, a family office of Keisuke Honda, a Japanese professional football player who once played for VVV-Venlo, AC Milan and CSKA Moscow in Europe. There exist several reasons why deep tech startups have successfully raised vast amounts of capital from and partnered with large corporations. In short, there is a clear win-win collaboration opportunity between large corporations and startups. Large corporations have for long focused their in-house R&D activities on strategic themes which are directly related to their core businesses, in order to increase the ROI/ Return on Investment and other efficiency indices. Therefore, they have hardly been able to deal with frontier technologies which are far from their existing businesses, resulting in a lack of innovations from Japanese corporations. This inconvenient mechanism in corporate R&D activities has produced motives for large corporations to search deep tech startups as their co-development partners. Since Japanese high-tech corporations require frontier technologies which cannot be developed in-house, startups spun-out from universities which usually have more advanced technologies become their main targets. In general, technologies in leading universities are considered to be 10 to 20 years more advanced than technologies in large corporations. However, deep tech startups spun-out from universities tend to lack know-how and capabilities to commercialize. Therefore, they are motivated to collaborate with and look for corporations which can support them to transform their technologies into viable products and services. Thus, the clear win-win collaboration opportunity has led to the recent tide of deep tech investments and corporate venturing. It is remarkable that some Japanese deep tech startups are already open to global. For example, ispace has an office in Luxemburg with 12 staffs. In addition, Rapyuta Robotics, a developer of cloud-connected low-cost multi-robot systems for security and inspection, is a spun-out venture from ETH Zurich. Furthermore, Xtreme-D, a developer of plug-in computing for next generation high-performance computing, has already opened an office in Silicon Valley, with the cooperation of WiL. Tier IV has also opened an office in Silicon Valley. One of the co-founders of Ascent Robotics, a startup for automation algorithms, is from the United States. As already mentioned, Infostellar and Trillium Secure have been funded by Airbus and Deutsche Bahn. In addition to the two, Floadia Corporation and Cerebrex, which are both semiconductor startups, have been funded by UMC Capital, the CVC arm of UMC, the world’s second largest semiconductor foundry based in Taiwan. There only exist a few examples of such globally-funded startups, but they indicate an omen that their followers will appear soon. In terms of hiring, some deep tech startups are comprised of multinational teams. Startups such as Ascent Robotics actively recruit staffs, especially engineers, globally and their job descriptions are prepared in English. As described above, Japanese deep tech startups have rapidly gained power for the last couple of years, through constant capital injection from and co-development with large corporations. At the same time, European MNCs such as Airbus and Deutsche Bahn have also reached and invested in some Japanese deep tech startups. These recent trends indicate that there exist further potentials of collaborations between Europe and Japan; Japanese deep tech startups could be relevant business partners and promising investees for European high-tech MNCs. This hypothesis is backed by four reasons. Firstly, quite a few Japanese deep tech startups are ventures spun-out from leading universities, and thus their technologies are foremost of its kind and generally more advanced than those in large corporations which themselves are front-runners in the world. This means that Japanese deep tech startups are worth partnering in terms of technology acquisition for European high-tech MNCs. Secondly, European and Japanese large corporations have similar organizational cultures and behaviors. For example, conservative senses of values, relatively slow and bureaucratic decision-making processes and high quality standards can be seen in both European and Japanese large corporations. This means that Japanese deep tech startups which have been co-working and therefore are now familiar with cultures and behaviors of Japanese large corporations could easily adapt to those of European ones. From the viewpoint of European high-tech MNCs, hurdles to collaborate with Japanese deep tech startups are fairly low now. Thirdly, economic and trade relationships between Europe and Japan are expected to strengthen due to the Agreement between the European Union and Japan for an Economic Partnership which just came into effect on February 1 st, 2019. The EPA will further encourage trade of goods and services and investment between the two parties. In addition to the national-level policies, the Tokyo Metropolitan Government has been promoting global expansions of startups based in Tokyo, through the X-Hub program in which selected startups are able to receive business support from mentors such as venture capitalists and seed accelerators in partner countries. Indeed, Tier IV and Ascent Robotics have been selected as startups of the Germany onward program. Lastly, Japanese deep tech startups have recently been more open to the global market but do not have proper business partners in Europe. This means that there exist white spaces for European high-tech MNCs to become their business partners. It is disheartening to see so many problem-less projects, with a solution – be it a technology, a policy, a feature, an intervention or training – being developed before there is an articulation, common understanding or qualification of the (real) problem it’s meant to solve. More often than not, failure is not a result of poorly executed solutions but a result of poorly defined problems. You could argue that the pareto-principle applies here: 80% of the ‘new’ innovation work you/r organisation is doing is probably solving the wrong problems. Before outlining the job spec of Head of Problems, I’ll reflect and connect four dots, a mix of observations, frustrations, and insights, which, when connected together, were the catalyst for penning this post. Dot one – Deconstructing the Chief Innovation Officer role: There is no shortage of quirky job titles out there – from innovation guerilla to innovation designer – but very few are well defined and in relation to other existing roles. One of the initial reasons I started writing these posts was because I saw the typical tenure of Chief Innovation Officer lasting on average 18 months. I hypothesise that one reason for this is that this one role is trying to do too much. An alternative view is to deconstruct the chief innovation officer role into key roles, best seen as a funnel, to make success not just possible, but more probable. ● The Head of Problems’ job is to identify, qualify and build an engaged community around the problem hypotheses. ● The Head of Experimentation’s job is to take the problem hypotheses and run multiple experiments with either a PoC, pilot, prototype, or MVP. ● The Head of Innovation’s job is to take the successful experiments and scaffold them into a sustainable solution. ● The Head of Blitzscaling’s job (source: Reid Hoffman) is to scale fast. Each of these roles require different skill-sets, mindsets, KPIs, resources, and methodologies. Of course, there are also risks and concerns with this configuration, too. Most notably, around the handovers. I don’t see these as distinct functions but as distinct roles within the same team, therefore avoiding any hard-handover. There is also a wider question of who they all report to. And, I would argue that they need to report to a Chief Growth Officer (but that’s for another post). Finally, there is a concern that most organisations won’t be able to create the business case for all these ‘new’ roles. But what’s the alternative, keep going with high rates of innovation failure and low ROI? Dot two – We are not incentivised to spend enough time in the problem space: Having had the pleasure and the pain of many failed (and a few successful) projects, strategy offsites, tech platforms, and community building initiatives, on reflection the failures occurred because we paid lip service to the problem, and moved quickly into the solution space (thinking, doing, drafting, creating). We’re not rewarded, supported, or evaluated on how well we define a problem. It can be perceived as not ‘action-oriented’ enough. We’re judged on how quickly we can move to the solution phase and into the real world – even when most of what we put out there will later fail, partly because we didn’t define the (right) problem to solve. ● An unfulfilled (customer) need, if significant, is a problem. ● An opportunity, especially if it’s a high value one, not capitalised on, is a problem. Going after an opportunity not rooted in a validated problem is a recipe for failure. ● A challenge is a problem. ● A pain-point is a problem. ● A missed target can be a symptom of a broader problem. Tristan raises an interesting point – if people are not trying to solve it, then it’s not really a problem. Essentially, we shouldn’t be cavalier in our use of the word ‘problem’. Yet, I feel that it’s our job to sell the problem by articulating the consequences of not solving it. Only when the consequences are significant does it become a problem. Dot four – Pitch problems downstream: On reflection, after many years in many different types of organisations, I realise that we spend an inordinate amount of time and mental energy selling concepts, ideas, and solutions higher up the chain (to executives). Most of the time we have no real clue what ideas will stick, and which ones will fail to yield any traction. Even if my immediate boss likes the idea, it usually goes up at least two to three levels. Each time you massage and craft the problem so that it looks good internally it gets further removed from reality. And the ideas that do stick often don’t end up having much of an impact because they are inherently safe. I propose that we do the reverse. Executives, as owners of the strategic problems, should pitch problems and then invite teams (inside and outside the organisation) to solve them. Now, for the job spec. Ultimately, the goal for Head of Problems is to develop a good ‘customer-problem-company’ fit. That is to say, to defineproblems that customers have which the company is uniquely positioned to go after. You may be thinking that solving problems is everyone’s job. Yes, it is. But the Head of Problems’ job is not to pick operational problems (e.g. we missed a sales target, which sits at the role level) but those which have potential to provide strategic growth. Another view is, aren’t these just new labels for existing roles, for example Head of Strategy? But, look at most Head of Strategy specs and you see very little if no mention of the word problem. Or, should it be the role of Head of Research? But this role goes beyond researching and documenting insights, especially with building a community around the prioritised problems. I’ve heard many people say something along the lines – we start our workshops with problem definition. Firstly, any problem definition done in a closed room is more often than not probably not an accurate reflection of reality. Even if it was, this is still only one third of the role – which is identifying and framing the problem. To emphasise, all three jobs of identifying, qualifying, and building an engaged community around the problems is needed – not as a one-time activity but a daily effort. Hence, the need for a role to build the structures, incentives, and processes that will enable these three jobs to run effectively. This role is by no means easy. It requires a different mindset from one that is required to validate solutions. ● Find problems that are hidden and locked in data – data from call centres, complaints, churn, and website forums. In this article, the hotel uses data to find problems (and humans to fix them). ● Find problems by going through the experience(s) of products daily (not just quarterly). They can be found in the waiting queues, with the pre and post failures of products/solutions. ● Find problems through people who’ve found workarounds. The positive deviance examples. ● Find problems in the collective intelligence of staff. Instead of the ‘submit your idea’ website, give them tools to ‘identify the problem’. Because the person framing the problem is not attached, required, or incentivised to come up with solutions, then the theory goes they will ask better questions by listening and observing. ● Find problems directly from existing customers. Not by giving them a 50-question survey but by asking powerful questions such as ‘what’s one thing that you would change?’ Or, create ‘customer incubators’. ● Find problems from an external community. Within the organisation there will always be inherent internal biases and constraints, which limit the view of the problems and subsequent solutions. The Head of Problems can source externals such as entrepreneurs-in-residence to identify the problems, without the organisation-first lens. This identification process is inherently messy, non-linear, and uncertain – not knowing when and where the next strategic problem will be uncovered. As Head of Problems, once you’ve created a repeatable process to identify problems, the next step is to qualify the problems. Very few of us are good judges of solutions that are pitched to us. Especially solutions that are conjecture, hypotheses, and require a few mental leaps to visualise success. With problem qualification, it’s a lot easier to be objective about the problem and therefore pick higher potential urgent and important problems to be solved. There is no single perfect tool to qualify problems. There are others who have written about this, so here I’ll merely highlight three additional tools: problem-spider, problem-hypotheses, and problem-portfolio. The Head of Problems should be asking questions that touch on all these dimensions, to get a holistic understanding of the problem. The problem-spider is a visual representation of how confident you feel that you have the answers along each of the dimensions. On the right-hand side is the external views of the problem and on the left the internal views. The further out the placement of the dot, the more evidence you have to back it up. ● Frequency of it – Does this problem occur on a daily, monthly or infrequent basis? ● Cost of solving the problem – How much effort is currently spent on the unsolved problem? Do customers/users put together a partial solution to minimise the problem or solve it by making a workaround that compromises on cost, quality, time, usability, etc.? What are the costs of existing solutions (including manual workarounds, competitors etc.)? ● Cost of not solving it today – Quantify the consequences of this problem not being solved from the customers’ perspective. ● Actively solving it – Identify a particular use-case not a generic definition of the problem. It’s a lot cheaper to sell the solution that solves the problem to a user than to educate the user about the problem in the first place. ● How long it takes to solve the problem – The problem may occur daily, but if it only takes a minute to solve it is less important than spending 15 minutes every day on a problem. Time is one measure. You may look at other measures. ● Urgency of solving it – What’s the level of urgency, in terms of existing strategy alignment, resource allocation, prioritisation, etc. to solve this problem? ● Cost of solving it – What’s the internal cost to staff and budget to at least begin experimenting to solve this problem? ● Total addressable problem – How big is the market size for this particular problem? Is it significantly large enough for a CxO for a Business Unit Director, a product manager, or sales staff to care about? ● Feasibility of solving it – How feasible is it in terms of existing skill sets, mindsets, networks etc. to prioritise solving it? ● Complexity of problem – Does it require one person to buy and use or is it more complicated, e.g. a buyer, user, influencers. These are all different people. This is a living breathing visual. If it’s not being updated throughout all the phases of solution development, then its impact is reduced. Getting to this relatively simple view of the problem involves doing uncomfortable and sometimes time-consuming activities. For example, living or ‘apprenticing with the problem’, solving the problem with pure human intervention (no product/service development), and post-mortems of past failures and pre-mortems of the current problem definition. There is never a one right view or frame of the problem. The Head of Problems can use the problem-matrix (below) to frame the problem from different perspectives – mapping different levels of risk (what should be tested first during the search rather than at the start or scale stage) with different types of problem hypotheses (desirability, feasibility, viability, efficacy, etc.). As Peter Drucker said: “There is nothing so useless as doing efficiently that which should not be done at all.” As Head of Problems, once you’ve qualified problems, you need to develop a problem portfolio. Categorise problems according to core, adjacent, and disruptive customer needs, rank them according to value, strategic alignment, etc. A tool for this will be shared in my forthcoming book. Finally, the third part of the job spec is to resource the problem with a community, a diverse set of ‘who’, vested in the problem. It’s not enough for the Head of Problems to ‘fall in love with the problem, not the solution’, a whole community needs to, too. All too often the reason why the solution-developers don’t spend time with customers/users is because it’s outside of their habits and norms, or they are not easily accessible. Internal community: In every one of our organisations we are faced with many orphan problems – those that continue to persist because they have no owner. The job of Head of Problems is not just to find an executive ‘problem sponsor’, but also to build an internal community around the problem. They can find ‘problem advocates’ whose role tangentially can be impacted if the problem is solved, ‘problem followers’ who are keen to see it progress and will jump in when there is traction, or ‘problem blockers’, etc. Each of these will advance the problem thesis and eventually solve it through different conversations. Problem-solving (external) networks: Too often when trying to solve a complex problem, the necessary skill sets, mindsets, permissions, etc. won’t all be available in-house. The Head of Problems’ job is to build or harness the value of networks which form around problems. Networks made up of people from public and private organisations of all sizes. Customer community: Tristan is astute in his observation that “When entrepreneurs start talking about problems, they stop talking about people”. That’s why the Head of Problems’ job is to ensure that customers facing the problem, most likely the early adopters, are easily accessible and part of the journey at the beginning and not just the end when trying to sell the solution to them. In summary, the Head of Problems’ job is to create a repeatable process to a) identify, b) qualify, and c) build a community around the problems that are worth solving. It is the great multiplication of the production of all the different arts, in consequence of the division of labour, which occasions, in a well-governed society, that universal opulence which extends itself to the lowest ranks of the people. Every workman has a great quantity of his own work to dispose of beyond what he himself has occasion for; and every other workman being exactly in the same situation, he is enabled to exchange a great quantity of his own goods for a great quantity, or, what comes to the same thing, for the price of a great quantity of theirs. He supplies them abundantly with what they have occasion for, and they accommodate him as amply with what he has occasion for, and a general plenty diffuses itself through all the different ranks of society. Smith identified that when men and women specialize their skills, and also importantly “trade” with one another, the end result is a rise in productivity and standard of living for everyone. In 1817, David Ricardo published On the Principles of Political Economy and Taxation where he expanded upon Smith’s work in developing the theory of Comparative Advantage. What Ricardo proved mathematically, is that if one country has simply a comparative advantage (not even an absolute one), it still is in everyone’s best interest to embrace specialization and free trade. In the end, everyone ends up in a better place. There are two key requirements for these mechanisms to take force. First and foremost, you need free and open trade. It is quite bizarre to see modern day politicians throw caution to the wind and ignore these fundamental tenants of economic science. Time and time again, the fact patterns show that when countries open borders and freely trade, the end result is increased economic prosperity. The second, and less discussed, requirement is for the two parties that should trade to be aware of one another’s goods or services. Unfortunately, either information asymmetry or physical distances and the resulting distribution costs can both cut against the economic advantages that would otherwise arise for all. Any discussion of Internet marketplaces begins with the first quintessential marketplace, ebay(*). Pierre Omidyarfounded AuctionWeb in September of 1995, and its rise to fame is legendary. What started as a web site to trade laser pointers and Beanie Babies (the Pez dispenser start is quite literally a legend), today enables transactions of approximately $100B per year. Over its twenty-plus year lifetime, just over one trillion dollars in goods have traded hands across eBay’s servers. These transactions, and the profits realized by the sellers, were truly “unlocked” by eBay’s matching and auction services. In 1999, Jack Ma created Alibaba, a Chinese-based B2B marketplace for connecting small and medium enterprise with potential export opportunities. Four years later, in May of 2003, they launched Taobao Marketplace, Alibaba’s answer to eBay. By aggressively launching a free to use service, Alibaba’s Taobao quickly became the leading person-to-person trading site in China. In 2018, Taobao GMV (Gross Merchandise Value) was a staggering RMB2,689 billion, which equates to $428 billion in US dollars. There have been many other successful goods marketplaces that have launched post eBay & Taobao — all providing a similar service of matching those who own or produce goods with a distributed set of buyers who are particularly interested in what they have to offer. In many cases, a deeper focus on a particular category or vertical allows these marketplaces to distinguish themselves from broader marketplaces like eBay. In 2000, Eric Baker and Jeff Fluhr founded StubHub, a secondary ticket exchange marketplace. The company was acquired by ebay in January 2007. In its most recent quarter, StubHub’s GMV reached $1.4B, and for the entire year 2018, StubHub had GMV of $4.8B. Launched in 2005, Etsy is a leading marketplaces for the exchange of vintage and handmade items. In its most recent quarter, the company processed the exchange of $923 million of sales, which equates to a $3.6B annual GMV. Founded by Michael Bruno in Paris in 2001, 1stdibs(*) is the world’s largest online marketplace for luxury one-of-a-kind antiques, high-end modern furniture, vintage fashion, jewelry, and fine art. In November 2011, David Rosenblatt took over as CEO and has been scaling the company ever since. Over the past few years dealers, galleries, and makers have matched billions of dollars in merchandise to trade buyers and consumer buyers on the platform. Poshmark was founded by Manish Chandra in 2011. The website, which is an exchange for new and used clothing, has been remarkably successful. Over 4 million sellers have earned over $1 billion transacting on the site. Julie Wainwright founded The Real Real in 2011. The company is an online marketplace for authenticated luxury consignment. In 2017, the company reported sales of over $500 million. In 2015, Eddy Lu and Daishin Sugano launched GOAT, a marketplace for the exchange of sneakers. Despite this narrow focus, the company has been remarkably successful. The estimated annual GMV of GOAT and its leading competitor Stock X is already over $1B per year (on a combined basis). With the launch of Airbnb in 2008 and Uber(*) in 2009, these two companies established a new category of marketplaces known as the “sharing economy.” Homes and automobiles are the two most expensive items that people own, and in many cases the ability to own the asset is made possible through debt — mortgages on houses and car loans or leases for automobiles. Despite this financial exposure, for many people these assets are materially underutilized. Many extra rooms and second homes are vacant most of the year, and the average car is used less than 5% of the time. Sharing economy marketplaces allow owners to “unlock” earning opportunities from these underutilized assets. When Garrett Camp and Travis Kalanick founded Uber in 2009, they hatched the industry now known as ride-sharing. Today over 3 million people around the world use their time and their underutilized automobiles to generate extra income. Without the proper technology to match people who wanted a ride with people who could provide that service, taxi and chauffeur companies were drastically underserving the potential market. As an example, we estimate that ride-sharing revenues in San Francisco are well north of 10X what taxis and black cars were providing prior to the launch of ride-sharing. These numbers will go even higher as people increasingly forgo the notion of car ownership altogether. We estimate that the global GMV for ride sharing was over $100B in 2018 (including Uber, Didi, Grab, Lyft, Yandex, etc) and still growing handsomely. Assuming a 20% rake, this equates to over $80B that went into the hands of ride-sharing drivers in a single year — and this is an industry that did not exist 10 years ago. The matching made possible with today’s GPS and Internet-enabled smart phones is a massive unlocking of wealth and value. While it is a lesser known category, using your own backyard and home to host dog guests as an alternative to a kennel is a large and growing business. Once again, this is an asset against which the marginal cost to host a dog is near zero. By combining their time with this otherwise unused asset, dog sitters are able to offer a service that is quite compelling for consumers. Rover.com (*) in Seattle, which was founded by Greg Gottesman and Aaron Easterly in 2011, is the leading player in this market. (Benchmark is an investor in Rover through a merger with DogVacay in 2017). You may be surprised to learn that this is already a massive industry. In less than a decade since the company started, Rover has already paid out of half a billion dollars to hosts that participate on the platform. While not as well known as the goods exchanges or sharing economy marketplaces, there is a growing and exciting increase in the number of marketplaces that help match specifically skilled labor with key opportunities to monetize their skills. 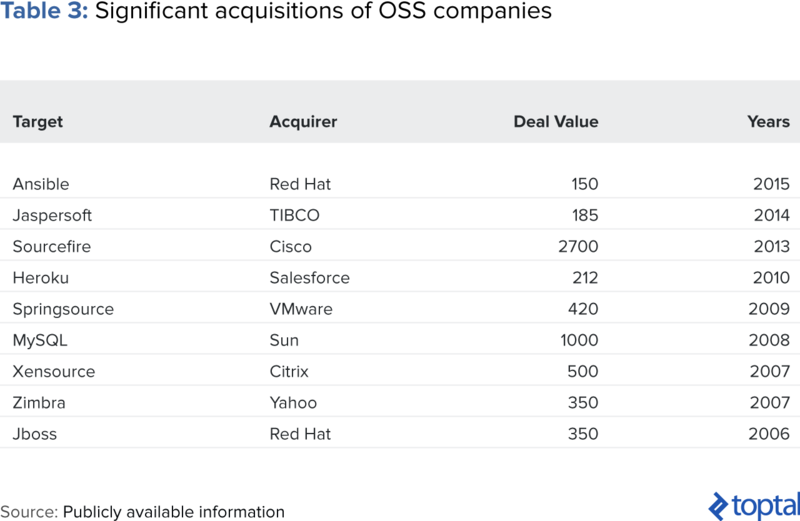 The most noteworthy of these is likely Upwork(*), a company that formed from the merger of Elance and Odesk. Upwork is a global freelancing platform where businesses and independent professionals can connect and collaborate remotely. Popular categories include web developers, mobile developers, designers, writers, and accountants. 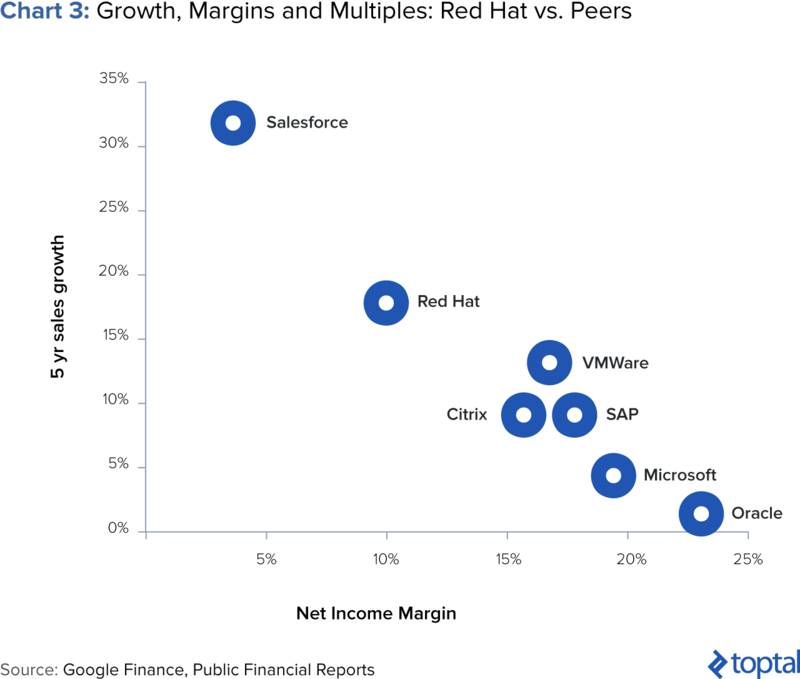 In the 12 months ended June 30, 2018, the Upwork platform enabled $1.56 billion of GSV (gross services revenue) across 2.0 million projects between approximately 375,000 freelancers and 475,000 clients in over 180 countries. These labor matches represent the exact “world is flat” reality outlined in Friedman’s book. HackerOne(*) is the leading global marketplace that coordinates the world’s largest corporate “bug bounty” programs with a network of the world’s leading hackers. The company was founded in 2012 by Michiel Prins, Jobert Abma, Alex Rice and Merijn Terheggen, and today serves the needs of over 1,000 corporate bug bounty programs. On top of that, the HackerOne network of over 300,000 hackers (adding 600 more each day) has resolved over 100K confirmed vulnerabilities which resulted in over $46 million in awards to these individuals. There is an obvious network effect at work when you bring together the world’s leading programs and the world’s leading hackers on a single platform. The Fortune 500 is quickly learning that having a bug bounty program is an essential step in fighting cyber crime, and that HackerOne is the best place to host their program. Wyzant is a leading Chicago-based marketplace that connects tutors with students around the country. The company was founded by Andrew Geant and Mike Weishuhn in 2005. The company has over 80,000 tutors on its platform and has paid out over $300 million to these professionals. The company started matching students with tutors for in-person sessions, but increasingly these are done “virtually” over the Internet. Stitch Fix (*) is a leading provider of personalized clothing services that was founded by Katrina Lake in 2011. While the company is not primarily a marketplace, each order is hand-curated by a work-at-home “stylist” who works part-time on their own schedule from the comfort of their own home. Stitch Fix’s algorithms match the perfect stylist with each and every customer to help ensure the optimal outcome for each client. As of the end of 2018, Stitch Fix has paid out well over $100 million to their stylists. Swing Education was founded in 2015 with the objective of creating a marketplace for substitute teachers. While it is still early in the company’s journey, they have already established themselves as the leader in the U.S. market. Swing is now at over 1,200 school partners and has filled over 115,000 teacher absence days. They have helped 2,000 substitute teachers get in the classroom in 2018, including 400 educators who earned permits, which Swing willingly financed. While it seems obvious in retrospect, having all substitutes on a single platform creates massive efficiency in a market where previously every single school had to keep their own list and make last minute calls when they had vacancies. And their subs just have to deal with one Swing setup process to get access to subbing opportunities at dozens of local schools and districts. RigUp was founded by Xuan Yong and Mike Witte in Austin, Texas in March of 2014. RigUp is a leading labor marketplace focused on the oilfield services industry. “The company’s platform offers a large network of qualified, insured and compliant contractors and service providers across all upstream, midstream and downstream operations in every oil and gas basin, enabling companies to hire quickly, track contractor compliance, and minimize administrative work.” According to the company, GMV for 2017 was an impressive $150 million, followed by an astounding $600 million in 2018. Often, investors miss out on vertically focused companies like RigUp as they find themselves overly anxious about TAM (total available market). As you can see, that can be a big mistake. VIPKid, which was founded in 2013 by Cindy Mi, is a truly amazing story. The idea is simple and simultaneously brilliant. VIPKid links students in China who want to learn English with native English speaking tutors in the United States and Canada. All sessions are done over the Internet, once again epitomizing Friedman’s very flat world. In November of 2018, the company reported having 60,000 teachers contracted to teach over 500,000 students. Many people believe the company is now well north of a US$1B run rate, which implies that around $1B will pass hands from Chinese parents to western teachers in 2019. That is quite a bit of supplemental income for U.S.-based teachers. These vertical labor marketplaces are to LinkedIn what companies like Zillow, Expedia, and GrubHub are to Google search. Through a deeper understanding of a particular vertical, a much richer perspective on the quality and differentiation of the participants, and the enablement of transactions — you create an evolved service that has much more value to both sides of the transaction. And for those professionals participating in these markets, your reputation on the vertical service matters way more than your profile on LinkedIn. Having been a fortunate investor in many of the previously mentioned companies (*), Benchmark remains extremely excited about future marketplace opportunities that will unlock wealth on the Internet. Here are an example of two such companies that we have funded in the past few years. The New York Times describes Hipcamp as “The Sharing Economy Visits the Backcountry.” Hipcamp(*) was founded in 2013 by Alyssa Ravasio as an engine to search across the dozens and dozens of State and National park websites for campsite availability. As Hipcamp gained traction with campers, landowners with land near many of the National and State parks started to reach out to Hipcamp asking if they could list their land on Hipcamp too. Hipcamp now offers access to more than 350k campsites across public and private land, and their most active private land hosts make over $100,000 per year hosting campers. This is a pretty amazing value proposition for both land owners and campers. If you are a rural landowner, here is a way to create “money out of nowhere” with very little capital expenditures. And if you are a camper, what could be better than to camp at a unique, bespoke campsite in your favorite location. Instawork(*) is an on-demand staffing app for gig workers (professionals) and hospitality businesses (partners). These working professionals seek economic freedom and a better life, and Instawork gives them both — an opportunity to work as much as they like, but on their own terms with regard to when and where. On the business partner side, small business owners/managers/chefs do not have access to reliable sources to help them with talent sourcing and high turnover, and products like LinkedIn are more focused on white-collar workers. Instawork was cofounded by Sumir Meghani in San Franciso and was a member of the 2015 Y-Combinator class. 2018 was a break-out year for Instawork with 10X revenue growth and 12X growth in Professionals on the platform. The average Instawork Professional is highly engaged on the platform, and typically opens the Instawork app ten times a day. This results in 97% of gigs being matched in less than 24 hours — which is powerfully important to both sides of the network. Also noteworthy, the Professionals on Instawork average 150% of minimum wage, significantly higher than many other labor marketplaces. This higher income allows Instawork Professionals like Jose, to begin to accomplish their dreams. As you can see, these numerous marketplaces are a direct extension of the productivity enhancers first uncovered by Adam Smith and David Ricardo. Free trade, specialization, and comparative advantage are all enhanced when we can increase the matching of supply and demand of goods and services as well as eliminate inefficiency and waste caused by misinformation or distance. As a result, productivity naturally improves. The following is a condensed and slightly modified version of a Radicle working paper on the startup economy in which we explore post-money valuations by venture capital stage classifications. We find that valuations have interesting distributional properties and then go on to describe a statistical model for estimating an undisclosed valuation with considerable ease. In conjunction with this post, we are releasing a free tool for estimating startup valuations. To use the tool and to download the full PDF of the working paper, go here, but please read the entirety of this post before doing so. This is not magic and the details matter. With that said, grab some coffee and get comfortable––we’re going deep. It’s often difficult to comprehend the significance of numbers thrown around in the startup economy. If a company raises a $550M Series F at a valuation of $4 billion  — how big is that really? How does that compare to other Series F rounds? Is that round approximately average when compared to historical financing events, or is it an anomaly? At Radicle, a disruption research company, we use data science to better understand the entrepreneurial ecosystem. 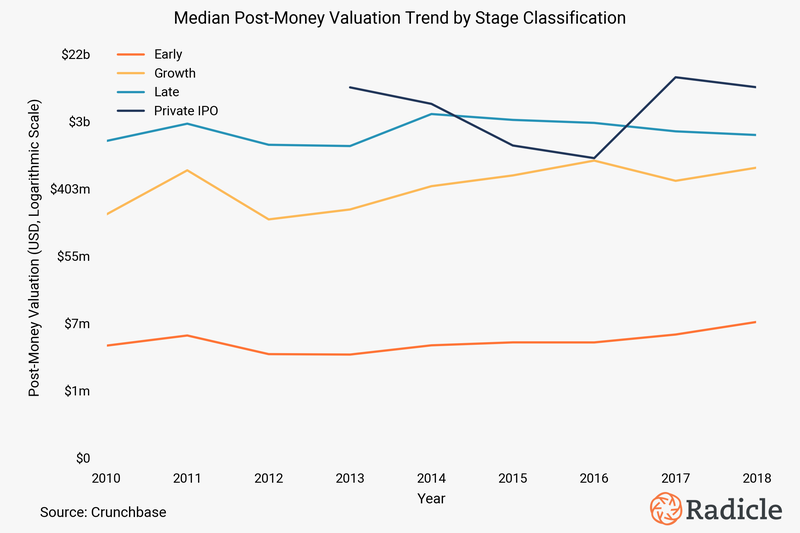 In our quest to remove opacity from the startup economy, we conducted an empirical study to better understand the nature of post-money valuations. While it’s popularly accepted that seed rounds tend to be at valuations somewhere in the $2m to the $10m valuation range , there isn’t much data to back this up, nor is it clear what valuations really look like at subsequent financing stages. Looking back at historical events, however, we can see some anecdotally interesting similarities. Google and Facebook, before they were household names, each raised Series A rounds with valuations of $98m and $100m, respectively. More recently, Instacart, the grocery delivery company, and Medium, the social publishing network on which you’re currently reading this, raised Series B rounds with valuations of $400m and $457m, respectively. Instagram wasn’t too dissimilar at that stage, with a Series B valuation of $500m before its acquisition by Facebook in 2012. Moving one step further, Square (NYSE: SQ), Shopify (NYSE: SHOP), and Wish, the e-commerce company that is mounting a challenge against Amazon, all raised Series C rounds with valuations of exactly $1 billion. Casper, the privately held direct-to-consumer startup disrupting the mattress industry, raised a similar Series C with a post-money valuation of $920m. Admittedly, these are probably only systematic similarities in hindsight because human minds are wired to see patterns even when there aren’t any, but that still makes us wonder if there exists some underlying trend. Our research suggests that there is, but why is this important? We think entrepreneurs, venture capitalists, and professionals working in corporate innovation or M&A would benefit greatly from having an empirical view of startup valuations. New company financings are announced on a daily cadence, and having more data-driven publicly available research helps anyone that engages with startups make better decisions. That said, this research is solely for informational purposes and our online tool is not a replacement for the intrinsic, from the ground up, valuation methods and tools already established by the venture capital community. Instead, we think of this body of research as complementary — removing information asymmetries and enabling more constructive conversations for decision-making around valuations. We obtained data for this analysis from Crunchbase, a venture capital database that aggregates funding events and associated meta-data about the entrepreneurial ecosystem. Our sample consists of 8,812 financing events since the year 2010 with publicly disclosed valuations and associated venture stage classifications. Table I below provides summary statistics. The sample size for the median amount of capital raised at each stage is much higher [N=84k] because round sizes are more frequently disclosed and publicly available. To better understand the nature of post-money valuations, we assessed their distributional properties using kernel density estimation (KDE), a non-parametric approach commonly used to approximate the probability density function (PDF) of a continuous random variable . Put simply, KDE draws the distribution for a variable of interest by analyzing the frequency of events much like a histogram does. Non-parametric is just a fancy way of saying that the method does not make any assumption about the data being normally distributed, which makes it perfect for exercises where we want to draw a probability distribution but have no prior knowledge about what it actually looks like. The two plots immediately above and further down below show the valuation probability density functions for venture capital stages on a logarithmic scale, with vertical lines indicating the median for each class. Why on a logarithmic scale? 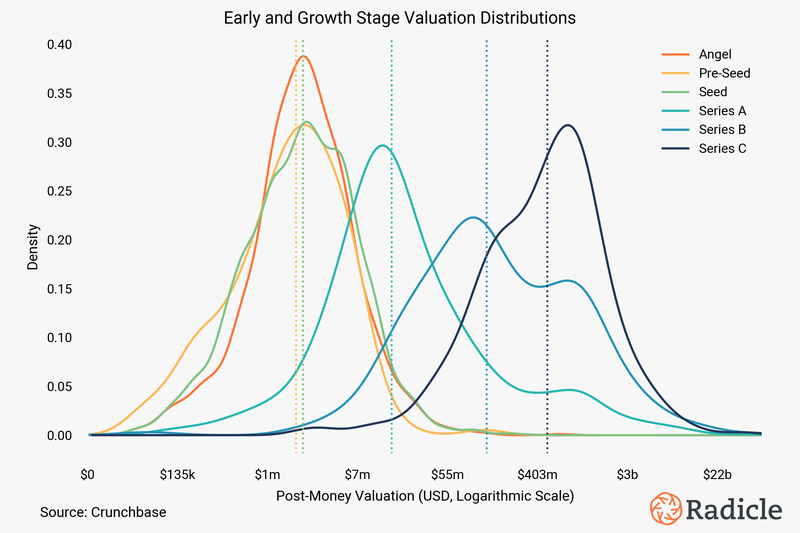 Well, post-money valuations are power-law distributed, as most things are in the venture capital domain , which means that the majority of valuations are at low values but there’s a long tail of rare but exceptionally high valuation events. Technically speaking, post-money valuations can also be described as being log-normally distributed, which just means that taking the natural logarithm of valuations produces the bell curves we’re all so familiar with. Series A, B, and C valuations may be argued as being bimodal log-normal distributions, and seed valuations may be approaching multimodality (more on that later), but technical fuss aside, this detail is important because log-normal distributions are easy for us to understand using the common language of mean, median, and standard deviation — even if we have to exponentiate the terms to put them in dollar signs. More importantly, this allows us to consider classical statistical methods that only work when we make strong assumptions about normality. Founders that seek venture capital to get their company off the ground usually start by raising an angel or a seed round. An angel round consists of capital raised from their friends, family members, or wealthy individuals, while seed rounds are usually a startup’s first round of capital from institutional investors . The median valuation for both angel and seed is $2.2m USD, while the median valuation for pre-seed is $1.9m USD. While we anticipated some overlap between angel, pre-seed and seed valuations, we were surprised to find that the distributions for these three classes of rounds almost completely overlap. This implies that these early-stage classifications are remarkably similar in reality. That said, we think it’s possible that the angel sample is biased towards the larger events that get reported, so we remain slightly skeptical of the overlap. And as mentioned earlier, the distribution of seed stage valuations appears to be approaching multimodality, meaning it has multiple modes. This may be due to the changing definition of a seed round and the recent institutionalization of pre-seed rounds, which are equal to or less than $1m in total capital raised and have only recently started being classified as ’Pre-seed” in Crunchbase (and hence the small sample size). There’s also a clear mode in the seed valuation distribution around $7m USD, which overlaps with the Series A distribution, suggesting, as others recently have, that some subset of seed rounds are being pushed further out and resemble what Series A rounds were 10 years ago . Around 21 percent of seed stage companies move on to raise a Series A  about 18 months after raising their seed — with approximately 50 percent of Series A companies moving on to a Series B a further 18–21 months out . In that time the median valuation jumps to $16m at the Series A and leaps to $130m at the Series B stage. 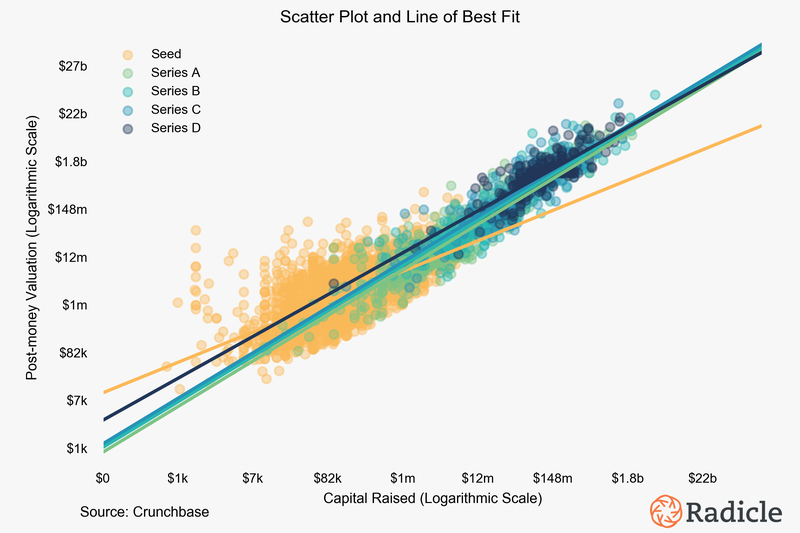 Valuations climb further to a median of $500m at Series C. In general, we think it’s interesting to see the binomial nature as well as the extent of overlap between the Series A, B, and C valuation distributions. It’s possible that the overlap stems from changes in investor behavior, with the general size and valuation at each stage continuously redefined. Just like some proportion of seed rounds today are what Series A rounds were 10 years ago, the data suggests, for instance, that some proportion of Series B rounds today are what Series C rounds used to be. This was further corroborated when we segmented the data by decades going back to the year 2000 and compared the resulting distributions. We would note, however, that the changes are very gradual, and not as sensational as is often reported . We classified each stage into higher level classes using the distributions above, as one of Early (Angel, Pre-Seed, Seed), Growth (Series A, B, C), Late (Series D, E, F, G), or Private IPO (Series H, I). With these aggregate classifications, we further investigated how valuations have faired across time and found that the medians (and means) have been more or less stable on a logarithmic scale. What has changed, since 2013, is the appearance of the “Private IPO” [11, 13]. These rounds, described above with companies such as SpaceX, Lyft, and others such as Palantir Technologies, are occurring later and at higher valuations than have previously existed. These late-stage private rounds are at such high valuations that future IPOs, if they ever occur, may end up being down rounds . 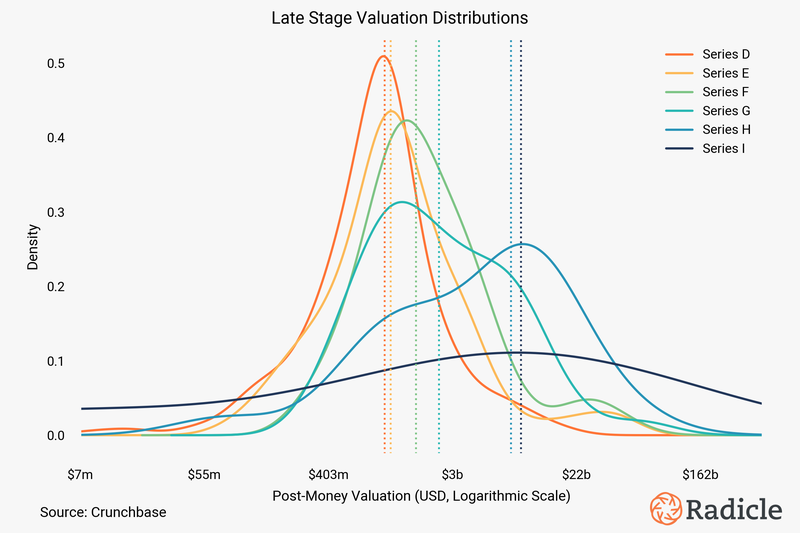 Given the above, we designed a simple statistical model to predict a round’s post-money valuation by its stage classification and the amount of capital raised. Why might this be useful? Well, the relationship between capital raised and post-money valuation is true by mathematical definition, so we’re not interested in claiming to establish a causal relationship in the classical sense. A startup’s post-money valuation is equal to an intrinsic pre-money valuation calculated by investors at the time of investment plus the amount of new capital raised [19, 21]. However, pre-money valuations are often not disclosed, so a statistical model for estimating an undisclosed valuation would be helpful when the size of a financing round is available and its stage is either disclosed as well or easily inferred. where y is the output post-money valuation, c is the amount of capital raised, r is a binary term that indicates the financing stage, and epsilon is the error term. log(c · r) is, therefore, an interaction term that specifies the amount of capital raised at a specific stage. The model we present does not include stage main effects because the model remains the same, whether they’re left in or pulled out, while the coefficients become reparameterizations of the original estimates . In other words, boolean stage main effects adjust the constant and coefficients while maintaining equivalent summed values — increasing the mental gymnastics required for interpretation without adding any statistical power to the regression. Capital main effects are not included because domain knowledge and the distributions above suggest that financing events are always indicative of a company’s stage, so the effect is not fixed, and therefore including capital by itself results in a misspecified model alongside interaction terms. Of course, whether or not a stage classification is agreed upon by investors and founders and specified on the term sheet is another matter. 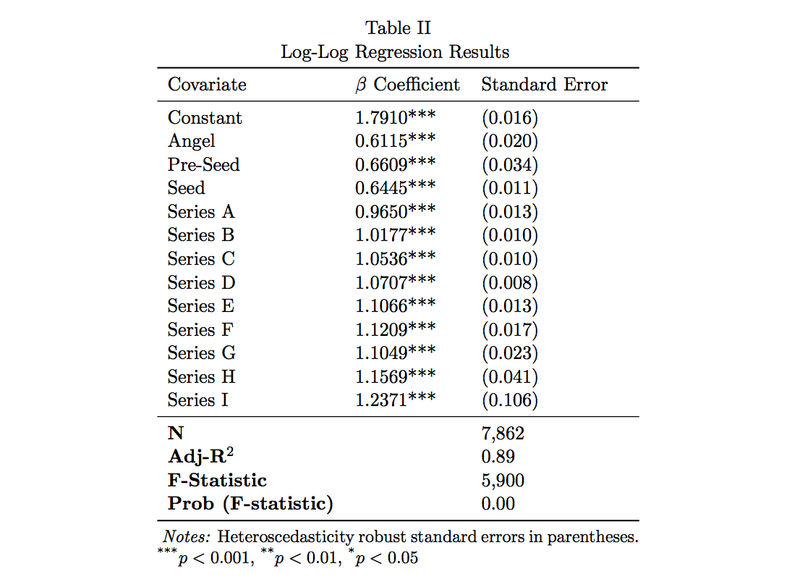 As is standard practice, we used heteroscedasticity robust standard errors to estimate the beta coefficients, and residual analysis via a fitted values versus residuals plot confirms that the model validates the general assumptions of ordinary least squares regression. There is no multicollinearity between the variables, and a Q-Q plot further confirmed that the data is log-normally distributed. The results are statistically significant at the p < 0.001 level for all terms with an adjusted R² of 89 percent and an F-Statistic of 5,900 (p < 0.001). Table II outlines the results. Monetary values in the model are specified in millions, USD. 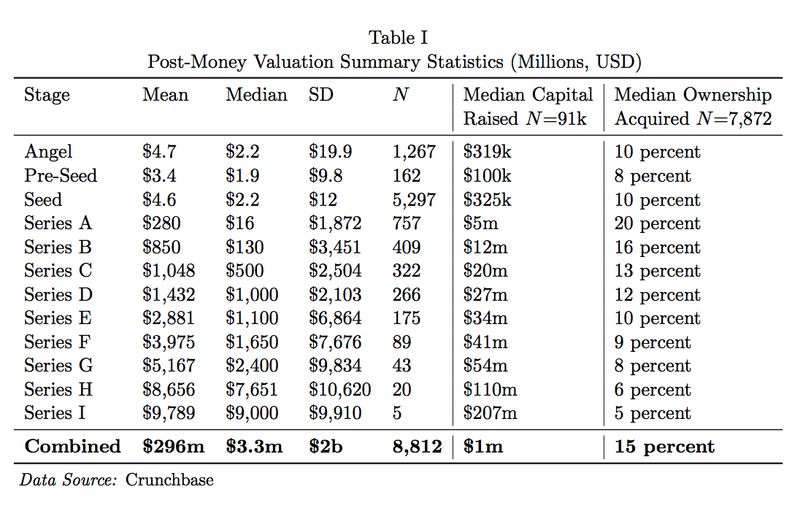 Using the first equation and the values in Table II, the estimated undisclosed post-money valuation of a startup after a $2m seed round is approximately $9.4m USD — for a $35m Series B, it’s $224m — and for a $200m Series D, it’s $1.7b. Subtracting the amount of capital raised from the estimated post-money valuation would yield an estimated pre-money valuation. Can it really be that simple? Well, that depends entirely on your use case. If you want to approximate a valuation and don’t have the tools to do so, and can’t get on the phone with the founders of the company, then the calculations above should be good enough for that purpose. If instead, you’re interested in purchasing a company, this is a good starting point for discussions, but you probably want to use other valuation methods, too. As mentioned earlier, this research is not meant to supplant existing valuation methodologies established by the venture capital community. where the distribution of log(y) given X, an n · k matrix of interaction terms, is normal with a mean that is a linear function of X, observation errors are independent and of equal variance, and I represents an n · n identity matrix. We fit the model with a non-informative flat prior using the No-U-Turn Sampler (NUTS), an extension of the Hamiltonian Monte Carlo MCMC algorithm , for which our model converges appropriately and has the desirable hairy caterpillar sampling properties . The 95 percent credible intervals in Figure V suggest that posterior distributions from angel to series E, excluding pre-seed, have stable ranges of highly probable values around our original OLS coefficients. However, the distributions become more uncertain at the later stages, particularly for series F, G, H, and I. This should be obvious, considering our original sample sizes for the pre-seed class and for the later stages. Since the data needs to be transformed back to its original scale for appropriate estimation, and the fact that the magnitudes of late-stage rounds tend to be very high, such changes in the exponential will lead to dramatically different prediction results. As with any simple tool then, your mileage may vary. For more accurate and precise estimates, we’d suggest hiring a data scientist to build a more sophisticated machine learning algorithm or Bayesian model to account for more features and hierarchy. If your budget doesn’t allow for it, the simple calculation using the estimates in Table II will get you in the ballpark. This paper provides an empirical foundation for how to think about startup valuations and introduces a statistical model as a simple tool to help practitioners working in venture capital approximate an undisclosed post-money valuation. That said, the information in this paper is not investment advice, and is provided solely for educational purposes from sources believed to be reliable. Historical data is a great indicator but never a guarantee of the future, and statistical models are never correct — only useful . This paper also makes no comment on whether current valuation practices result in accurate representations of a startup’s fair market value, as that is an entirely separate discussion . This research may also serve as a starting point for others to pursue their own applied machine learning research. We translated the model presented in this article into a more powerful learning algorithm  with more features that fills-in the missing post-money valuations in our own database. 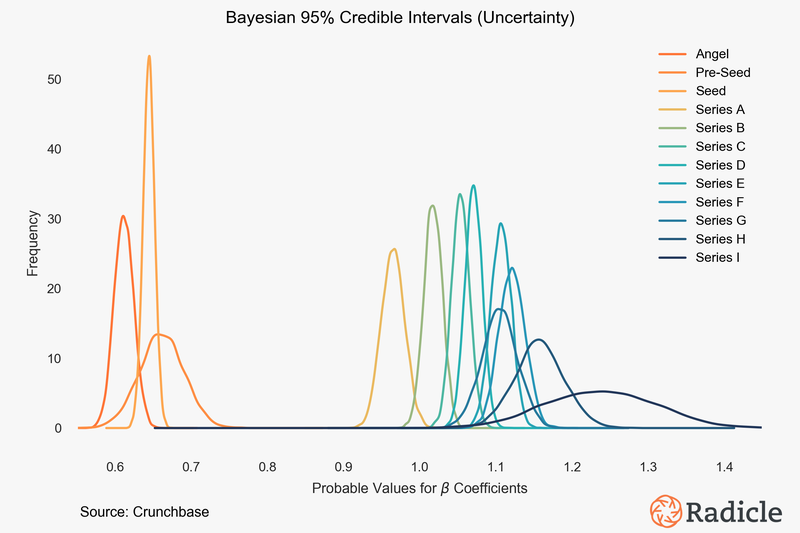 These estimates are then passed to Startup Anomaly Detection™, an algorithm we’ve developed to estimate the plausibility that a venture-backed startup will have a liquidity such as an IPO or acquisition event given the current state of knowledge about them. Our machine learning system appears to have some similarities with others recently disclosed by GV , Google’s venture capital arm, and Social Capital , with the exception that our probability estimates are available as part of Radicle’s research products. Companies will likely continue raising even later and larger rounds in the coming years, and valuations at each stage may continue being redefined, but now we have a statistical perspective on valuations as well as greater insight into their distributional properties, which gives us a foundation for understanding disruption as we look forward.